I always like to make at least one handmade Christmas ornament each year. They add that personalized touch and I really enjoy looking back at older ornaments as I pull out the Christmas decorations. This year I’m doing a wintery Christmas cabin theme in our family room so I decided to make some cute popsicle stick sleds. I’ve seen a few different versions of these popsicle stick sleds on Pinterest but initially saw them over on Fireflies and Mudpies. 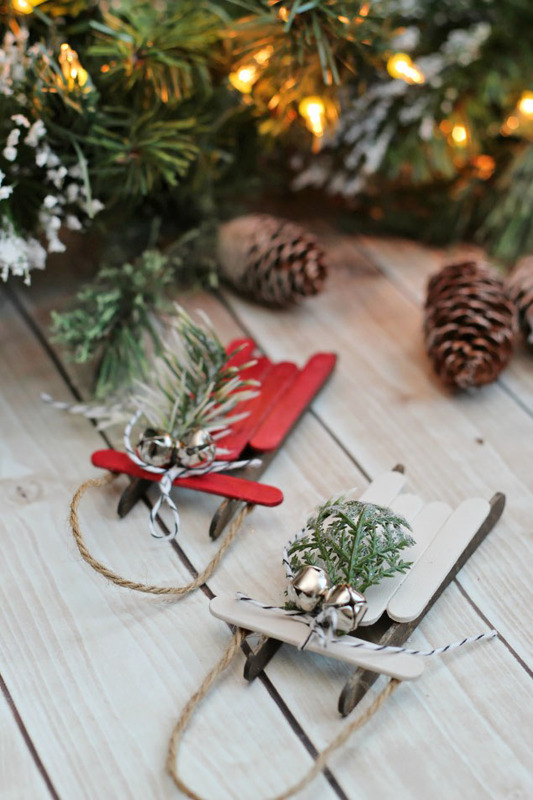 These cute little popsicle stick sleds are an easy Christmas craft that’s fun for both kids and adults. Make them as simple as you would like or dress them up with some creative embellishments! Glue 4 of the small craft sticks together staggering the end stick on each side slightly lower. I found the easiest way to apply the glue for this project was to squirt some glue out onto a paper plate and then use a large toothpick or skewer to apply the glue along the edges. Allow to dry. Paint the small craft sticks whatever color you would like. Allow to dry. Stain the regular sized craft sticks using a rag. Glue on the stained sled runners to the smaller popsicle sticks. Again this is much easier to do if you use a skewer or large toothpick to apply the glue. Glue on the cross stick to the front of the sled. 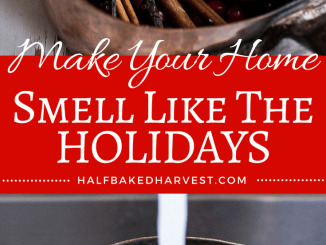 Add whatever embellishments you would like. 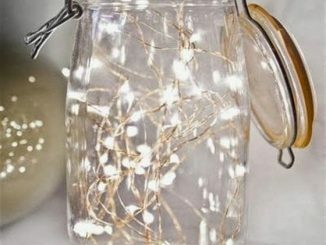 I took a few little sprigs of faux greenery, wrapped them in baker’s twine, and then threaded on a couple of small jingle bells. I then just tied the baker’s twine around the cross bar. If you’re doing this project with kids, they could decorate the sled or write their name and year on it. I’ve even seen some that add a photo to the sled. Cut some regular twine to your desired length and attach to the underside of the cross bar using glue dots. If you don’t have glue dots, you can use regular craft glue but, honestly, those glue dots are so much easier and way less messy. These little sleds look cute hung on the tree, but if you use a little creativity they can be used in many other ways as well. 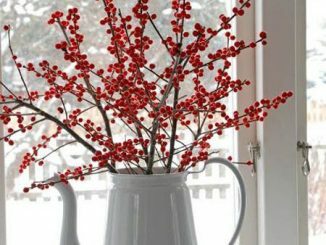 Use them in rustic Christmas vignettes, add them to Christmas presents, or use them as name cards on your Christmas table. The possibilities are endless!